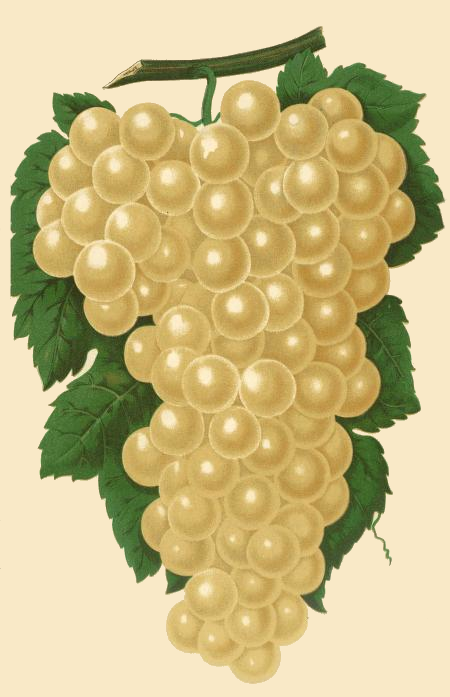 The Diamond White Grape Company from Rochester New York published a brochure in 1890 to introduce their new grape variety – shown off with this beautiful white grapes drawing. This lovely full-color lithograph shows an entire bunch of their white grapes. The Diamond white grape was marketed as the finest white grape ever produced in America – it was a sweet table and market grape. That meant it was yummy eaten straight from the vine or used in wine or jellies. This fruit image was drawn by an unknown artist over 120 years ago. It looks as great today as it did when it was first published. It shows a bit of grape vine with a full bunch of white grapes and several green grape leaves.